A year ago Microsoft first threw its hat into the tablet race with a new brand, a new OS and a completely new strategy. To make a challenging situation even more difficult, Microsoft chose to go after the traditional tablet market with a device that was neither a tablet nor a notebook. I was relatively pleased with both Surface devices that launched last year. Surface RT had potential, but it was too slow, needed a price adjustment and of course needed more maturity on the OS side. Surface Pro on the other hand needed to be thinner, needed Haswell and related, it needed better battery life. With its new commitment to being a devices & services company, Microsoft now joins the ranks of Apple and Google in shipping platforms with annual updates to hardware and software. Last week we saw the software side of the story, with a free update to Windows 8.1. It wasn’t too long ago that Microsoft was charging hundreds of dollars for new OS revisions, but with Apple and Google redefining what users come to expect from both cost and frequency of OS updates, Microsoft had to change. Today we get the second half of the story. Microsoft’s partners have already announced their Windows 8.1 launch devices, now it’s time for Microsoft. I’ll start with Surface 2, which sees the largest number of physical changes compared to its predecessor. It’s still built using the same injection molded magnesium manufacturing process (VaporMg, pronounced vapor mag), but moves to a 2-piece VaporMg design similar to Surface Pro. There’s the VaporMg tub and the kickstand. The look and feel of the device see substantial updates. 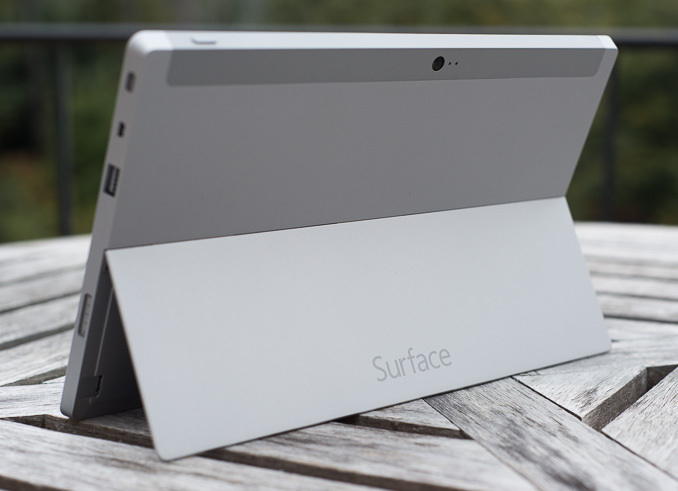 The finish of Surface 2 is now a light silver. Not only does the new finish not pick up grease/fingerprints like the previous black finish, but it also has a slightly more textured feel to it. Staring at Surface 2’s display head on you get a little bit of a silver border around the display, a nice touch. 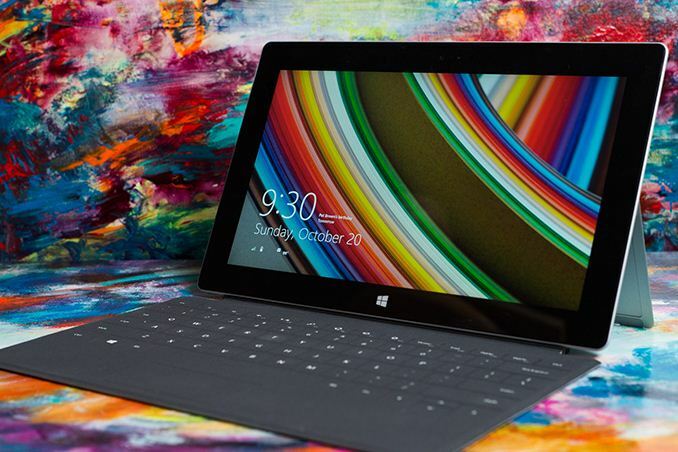 Surface 2’s construction feels every bit as solid and expensive as its predecessor. Both devices remain the absolute best built Windows tablets/notebooks on the market. Curiously enough both Surface 2 and Surface Pro 2 ditch the Windows 8 logo on the back of the kickstand in favor of a Surface logo. The devices in general continue to be devoid of excess branding. Both have a capacitive Windows button up front, the aforementioned Surface logo around back and some branding on their respective chargers. There are no stickers to remove, and no COA labels to worry about. It may be years later than we’d hoped, but Microsoft finally gets the beauty of clean aesthetics. The overall dimensions of Surface 2 don’t change much compared to its predecessor. We’re still dealing with the same 10.6-inch display size, although it sees an update to a 1080p panel with improved color accuracy. The panel size determines the overall device footprint, which explains why that doesn’t change this round. Thickness goes down a small amount from 0.37-inches to 0.35. The reduction is very subtle but helps contribute to the device feeling more right in hand. Weight improves slightly if you compare Surface 2 to Surface RT. While the latter weighed in at 1.5 lbs, Microsoft lists Surface 2 as weighing less than 1.49 lbs. The somewhat vague spec is designed to take into account variations in manufacturing. Microsoft encouraged me to weigh my Surface 2 review sample, which came in at 1.45 lbs compared to a flat 1.50 lbs for Surface RT. It’s a small difference, but a definite step in the right direction. If the rumors of a lighter iPad 5 are true however, I do wonder if Microsoft should’ve been a bit more aggressive on the weight reduction front this round. Just as before, Microsoft stresses the importance of looking at weight distribution not just overall weight specifications. Truth be told, Surface 2 doesn’t feel as heavy as the iPad despite having very similar weight specs. Well, wouldn’t you know, Microsoft listened. 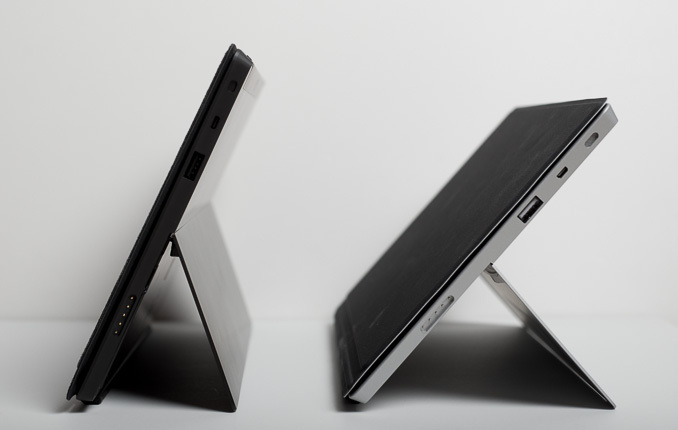 Surface 2 and Surface Pro 2 both feature a new, 2-stage kickstand. You still get the same solid action, same sound and even the same 24-degree opening angle, but now there’s a second stop in the kickstand’s travel at 40-degrees. The 2-stage design almost completely addresses my issues with the first generation of Surface tablets. While the 24-degree stop is perfect for desk use, the 40-degree stop is ideal for in-lap use. The second stop keeps me from having to strain my neck looking down at the display when I’m typing in cramped quarters (e.g. having to type out this review in the back of a car heading to an airport). Moving between stops on the new kickstand feels natural, and the new kickstand feels every bit as robust as its predecessor. I don’t know that Microsoft has perfected the design though. I could still use another stop (or two). Perhaps one at 15-degrees for the on-chest use case if I’m laying down with the tablet on my chest watching a movie. A real issue created by the 40-degree stop is now I need even more leg/thigh/lap-space to support the device. Since there’s no support to hold the display up until you get to the kickstand, you need to make sure that the kickstand has a place to rest when open at its widest angle. I don’t know the right mechanical solution to this concern, but I still feel like Microsoft has some more work ahead of it on the kickstand front. Behind the kickstand is a repositioned microSD card slot. It’s now further away from the kickstand hinge. 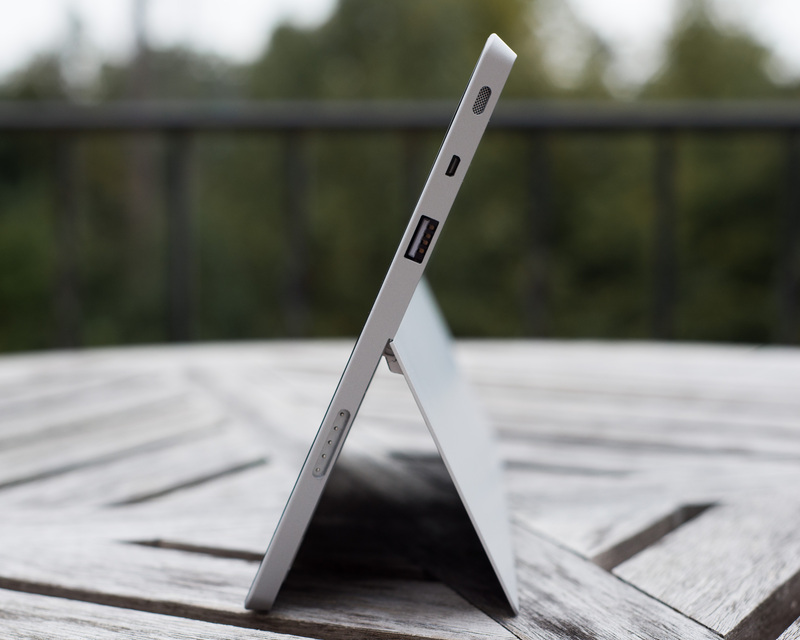 The ports/buttons around the edges of Surface 2 haven’t really changed compared to Surface RT. On the left you’ll find volume up/down buttons (which are appreciably clickier compared to my Surface RT review sample), a headphone jack and one of two speaker ports. On the top right there’s a power/lock button. On the right side you’ll find the other speaker port, micro HDMI output and a USB 3.0 port (new for Surface 2, RT only supported USB 2.0). All of the Surface devices retain the same custom, magnetic power connector as before. Along the bottom there’s a slightly updated accessory connector and channel for accepting Surface’s famed keyboard covers, as well as new accessories this round. All first generation Surface accessories are supported. Both front and rear facing cameras get a big upgrade with Surface 2. Surface RT shipped with two 1.2MP cameras, while Surface 2 moves to a 3.5MP front facing camera and a 5MP rear facing camera. Internally, the upgrades are even more substantial. NVIDIA’s Tegra 3 is out of the picture, replaced by a far faster Tegra 4 SoC. That’s four ARM Cortex A15 cores running at up to 1.7GHz (1.9GHz with only one core active), as well as a fifth power saver core that actually sees some use this time (more on this later). WiFi remains dual-band 2-stream 802.11n on both Surface 2 and Surface Pro 2, although whatever peak performance issues plagued me on Surface RT seem to be resolved (I could hit 120Mbps max transfers over 5GHz 802.11n). The tablet still ships with 2GB of memory, but now leverages a 64-bit wide memory interface. On the storage side the options are still 32GB or 64GB of eMMC. Dimensions 10.81 x 6.79 x 0.35" 10.81 x 6.77 x 0.37"
Battery capacity is still 31.5Wh and Surface 2 still ships with a 24W charger. 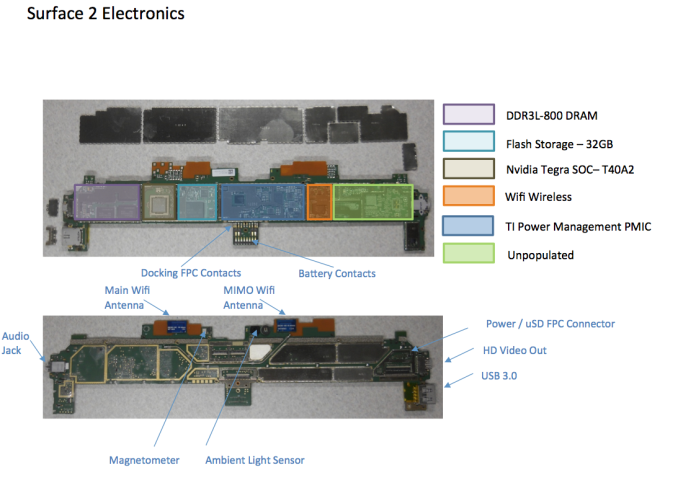 Surface 2 will draw 10W at the wall while charging, the over-specced adapter is designed to be able to power the system at full load without impacting charge times. On the software front, Surface 2 ships with Windows RT 8.1 and a full copy of Office 2013 RT Home & Student Edition. Pricing starts at $449 for a 32GB model, or $549 for the 64GB version. Touch and Type covers continue to be sold separately at $119 and $129, respectively. "Although IE11 does a relatively good job on the touch front, I find that heavy multitasking with IE11 on Surface 2 can result in a lot of hangs and crashes within tabs or the application itself." @Serr Well that's a lie! My iPhone 4 is crashing almost everyday when using Safari. Great review, but fails on the search for apps.